About this object Thomas Brackett Reed of Maine served simultaneously as Speaker of the House and Chairman of the Rules Committee. 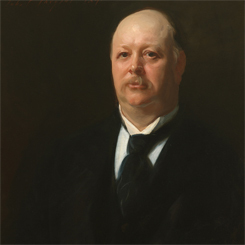 On this date, Speaker Thomas Brackett Reed of Maine resigned after serving 11 terms in the House. First elected to the 45th Congress (1877–1879), Reed became chairman of the Judiciary Committee in the 47th Congress (1881–1883) and a member of the Rules Committee. Like many Republicans of the period, he advocated government efforts to encourage economic development with protective tariffs, “business subsidies,” and a stable currency based on the gold standard. As a member of the minority party, Reed mastered parliamentary rules in order to obstruct majority legislation and to increase minority influence. This knowledge contributed to his election as Speaker during the 51st (1889–1891), 54th (1895–1897), and 55th (1897–1899) Congresses. Speaker Reed reorganized House practices and instituted an array of parliamentary changes known as “Reed’s Rules.” These included Reed’s successful effort to end the “disappearing quorum,” a minority delaying tactic that prevented the House from attaining the minimum number of Members necessary to conduct business. Sweeping aside past tradition, Reed counted all Members on the floor as “present” even if they did not respond to a roll call. “Rules should not be barriers,” Reed explained, “they should be guides.” Retiring to pursue a lucrative law practice to support his family, Reed died on December 7, 1902.